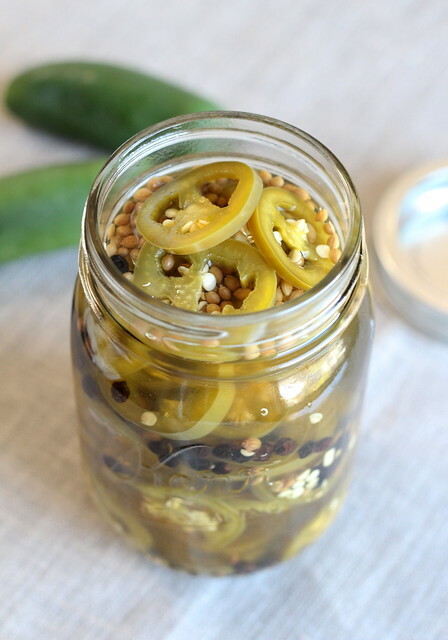 These pickled jalapeños are an easy little D.I.Y. project for you to tackle, no canning skills required! Be warned, though, you might be ruined after trying these, they are so much tastier than anything you can buy at the market with the perfect amount of crunch and fantastic balance of sweet-sour flavors — plus a delightful touch of citrus from the coriander seed. I love having a jar of these quick, spicy pickles in my fridge to give a little extra oomph to a platter of nachos, or even as a snack on their own! In a non-reactive saucepan, bring water and vinegar to a simmer. Stir in Kosher salt and sugar; bring to a hard boil. Continue to boil for 5 minutes. While vinegar mixture boils, combine bay leaf through jalapeños in a 1-quart Mason jar or other 3 cup+ heatproof container. Once brine is through boiling, remove from heat and pour over peppers. Give it a stir, poke down peppers to pack them in and make sure they’re covered completely (feel free to add a few more jalapeño slices if you have room!). Place the lid on the jar and let cool to room temperature (about 1 hour). Once cooled, refrigerate for about a week before using! ¹ Another great use for the OXO Hand-Held Mandoline Slicer set to the #3 thickness!